NO CREAMS, NO LOTIONS, NO NEEDLES. Just a capsule a day to improve your pigmentation problems and also giving you a fairer, healthier and better skin. Crystal Tomato Skin Care Supplement is made of 100% natural extracts ingredient with the unique breed of non-GMO tomato, containing crystal tomato® carotenoids which is one of the most nature whitening ingredients. It is just like eating any fresh tomatoes but giving you whitening and lightening function. Take daily over a long term period is not a problem as this is a high effective 100% natural supplement. It acts like a sunscreen protection in our skin from top to toe, protecting our skin from harmful rays so you can stay effortlessly fair and radiant. It protects our skin cell from inflammation when we highly expose under the sun, it delays our skin ageing speed as well as improves the way it affects our skin in the future. L-Cysteine, as an amino acid contains in this supplement helps to maintain the structure of proteins in your body and promotes healthy skin by encouraging collagen formation. It boosts our liver's production of Glutathione which is our body’s master anti-oxidant to maintain the health of our skin and also slow down our skin cell ageing rate. The secret to the efficacy of Crystal Tomato lies in the groundbreaking active ingredient - crystal tomato® carotenoids - one of nature's super whitening ingredients. Through a patented technology, crystal tomato® carotenoids have been successfully extracted and prepared for oral consumption. 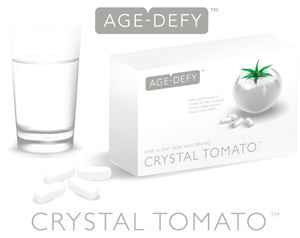 Find out more about Crystal Tomato products and begin your skin transformation journey. It is now available in Singapore. To make enquiries about Crystal Tomato products, click here.